theswca blog: Kenner Kids Vol. III: "Come on... PUNCH-ME!" Bop bags seem to be one of those ubiquitous children's toys that go back decades. The eternally punchable "Bozo the Clown" has to have endured beatings beyond reasonable measure by this point. With an apparently expanding popularity and selection in the 1960s (you could sock anyone from Huckleberry Hound to the Caped Crusader himself), it should come as no surprise that a set of these gluttons for punishment featuring Star Wars characters were among the early Kenner products available during the original film's era. Darth Vader and R2-D2 were soon joined by Chewbacca and Jawa for a "Bopping Good Time!" The two shorter characters (36") were then deemed "LIL BOPPERS" while the taller pair (50") became the "BIG BOPPERS." "Bop 'Em! Love 'Em! They Come Back For More!" In terms of product photography for packaging and catalogs, what good is a bop bag without an aggressive yet innocent child (aka "little boppers age 2 and up") landing a haymaker on it? The language in the 1978 Kenner Retailer Catalog is pretty straightforward for the Dark Lord of the Sith: "Kids love to give a good bop to arch villain DARTH VADER." Who wouldn't want to take out their frustrations on such a bully (or mean older sibling)? R2's description is a bit more complicated: "ARTOO-DETOO not only can be bopped, but loved." The kids in the toy's packaging above are definitely a bit more pensive about their attack. What is that one in the green sweater and killer plaid pants going for? A love tap? 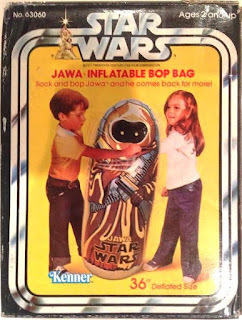 The second pair of boppers' packaging maintained the line's early primary color palette with some warm yellows to balance out the red and blue of Vader and R2. Blondie Bluepants here is delivering a solid left hook to an oddly modern-looking Chewbacca, with his pigtailed friend providing what looks to be a supplementary kick. Once again, the kids are a bit more timid in their assault on the "LIL BOPPER" Jawa, undecided on whether they feel compassion or disgust towards it. 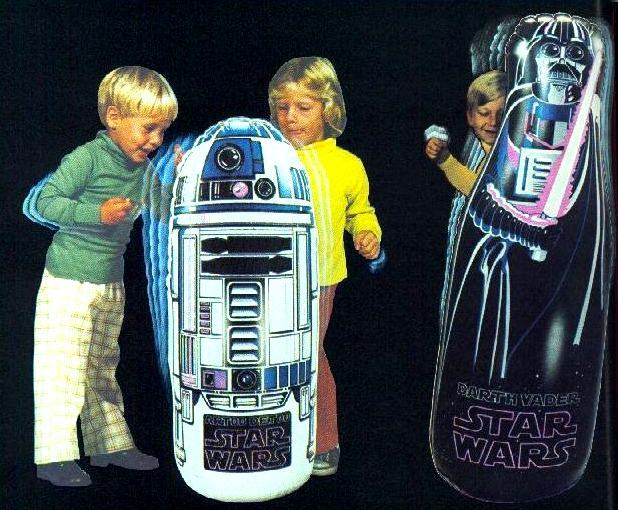 For those interested in international versions of these things, check out these Clipper Darth Vader and R2-D2 "acrobate gonflables" from the Netherlands, this Canadian Darth Vader Bop Bag, and this Japanese Takara Bop Bag featuring some unique artwork which is pictured in Steve Sansweet's Star Wars: 1,000 Collectibles: Memorabilia and Stories from a Galaxy Far, Far Away. Photos of production toys courtesy of Ron Salvatore and Duncan Jenkins.